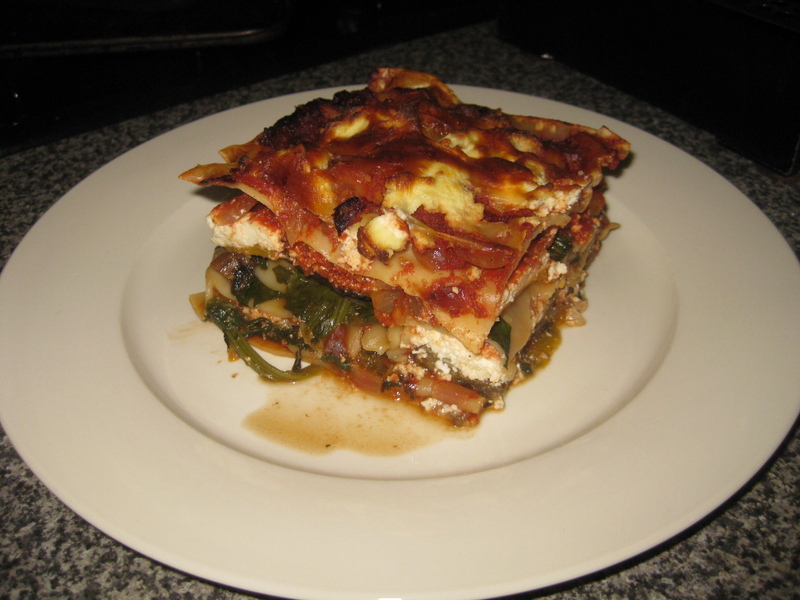 I have two lasagne recipes I wish to share with you. One is my mum’s lasagne, which is known far and wide as THE best lasagne in the world. Ever. But we must wait for her to make one of these beauties, and for me to photograph the evidence. Until then, my poorly yet healthy version of this all-time favourite pasta dish will have to suffice. I cannot vouch for the calorie count of this one. Perhaps I’ll stick it into Calorie King and find out one of these days…but until that day arrives, all I can say is that this meal is fairly low fat. Aside from the ricotta and spritz of oil here and there, the ingredients are simple and fairly non-greasy. This recipe will be one of my ‘guides’ rather than ‘recipe’ as such. Only because you can play around with it as much as you like. You can use what vegetables you want and sauce it up how you like. But this recipe here, is how I usually make it. Boil up the lasagne sheets. Yes. You heard me cook them up. Make your tomato sauce (see Notes on the recipe for more on this). Using a baking dish that is as big as you need it to be, or as small, start by covering the bottom with lasagne sheets. Layer with veges, tomato sauce and ricotta cheese. I have no advice which should go first or last. I am still experimenting with this myself. 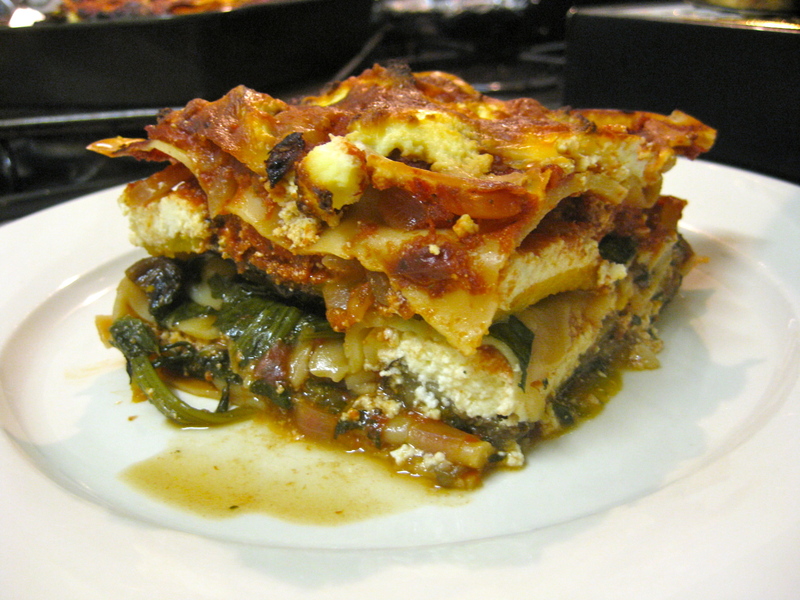 Layer until your ingredients are gone, and perhaps finish with a layer of lasagne, ricotta and tomato sauce. Sprinkle some parmesan and/or mozarella on the top. Cover with foil and bake for at least half an hour. Remove foil and leave until top gets melty/crispy…how you like it. To roast your veges, if you don’t know how already, just lay slices of the vegetables on baking trays and drizzle with a bit of olive oil and salt. Bake until they’re soft and browned. In regards to eggplant, I usually salt them and wash them before I bake them. Apparently this takes away the bitterness. But I am not an expert. You lay slices on paper towel and salt, leaving for about 10-15 minutes. You will see the liquid coming out of the slices. Then turn and repeat on other side. Then wash and dry them. I think pumpkin is a MUST for this recipe. The sweetness is just lovely. For a quick and easy tomato sauce, I simply saute a spanish onion and a couple of minced garlic cloves. Season with a tsp of brown sugar and celery salt and cook off for a minute or so. Then pour in either passata or a tin of tomatoes. Simmer for ten minutes or so. In regards to cheese, you can use parmesan as well as mozarella if you so desire. But make up the bulk with ricotta. Lara, regarding the lasagna sheets. You say to boil them, do u mean even the instant pasta sheets that don’t normally need pre cooking? Correct. Boil the pasta, so it isn’t dry. I would even boil them well. Because I didn’t boil them all the way last time and I felt that the meal would have been better if I had. The pasta wouldn’t have been so chewy.